The post The IDENTITY_CACHE Option in SQL Server appeared first on SQLNetHub. The post Finally, SSMS will talk to Azure SQL DW appeared first on LobsterPot Blogs. The post You’ve been doing cloud for years… appeared first on LobsterPot Blogs. The post The effort of relocating blog sites appeared first on LobsterPot Blogs. The last several releases of SQL Server have introduced a slew of new features, as well as improvements in existing functionality. One area of the engine which is easy to overlook is statistics. After all, statistics still get created the same way, they still tell you about the distribution of data, they’re still used by the Query Optimizer… what’s different? The basic function of statistics remains the same – but how they’re used by the Query Optimizer does change depending on the Cardinality Estimator you’re using. There are also several noteworthy changes related to updating statistics and new functionality has been added around viewing statistics information. Altogether, these changes across the latest releases can cause a variation in SQL Server behavior that you weren’t expecting. Note: This post is most applicable to SQL Server 2012 and higher, but some detail for prior releases is included for reference (and fun). The number of steps in a histogram is limited to 300. In SQL Server 6.5 and earlier a histogram would have the number of steps that could fit on a 2K page, based on the size of the first column in the key. The ‘automatically update statistics’ database option is introduced; previously statistics were only updated manually. The number of steps in the histogram is reduced from 300 to 200 (technically 201, if you include the step for NULL, assuming the first column in the key allows NULLs). Updates to statistics that use FULLSCAN can run in parallel. Trace Flags 2389 and 2390 are introduced in SP1 to help with the Ascending Key issue, described in the post, Ascending Keys and Auto Quick Correct Statistics. A detailed example of this scenario is provided in my post Trace Flag 2389 and the new Cardinality Estimator. The instance option ‘Automatically Update Statistics Asynchronously’ is introduced. Note that in order for this to be in effect, the option ‘Automatically Update Statistics’ must also be enabled. If you’re not clear on what this option does, review the documentation in ALTER DATABASE SET Options. This is a setting that Glenn recommends (as noted in his post referenced below), but I think it’s important to be aware of potential issues, as noted in How Automatic Updates to Statistics Can Affect Query Performance. Note: There is a memory leak related to this setting in SQL Server 2008 through SQL Server 2012; please see Glenn’s post Important Hotfix for SQL Server 2008 for more details. Filtered statistics are introduced, and these can be created separately from a filtered index. There are some limitations around filtered indexes with regard to the Query Optimizer (see Tim Chapman’s post The Pains of Filtered Indexes and Paul White’s post Optimizer Limitations with Filtered Indexes) post, and it’s important to understand the behavior of the counter that tracks modifications (and thus can trigger automatic updates). See Kimberly’s post Filtered indexes and filtered stats might become seriously out-of-date for more details, and I also recommend checking out her stored procedure that analyzes data skew and recommends where you can create filtered statistics to provide more information to the Query Optimizer. I’ve implemented this for several large customers that have VLTs and skewed distribution across columns frequently used in predicates. Two new catalog views, sys.stats and sys.stats_columns, are added to provide easier insight into statistics and included columns. Use these two views instead of sp_helpstats, which is deprecated and provides less information. Trace Flag 2371 is made available, which can be used to reduce the number of modifications required for automatic updates to statistics to occur. As a reminder, I’m a fan of updating statistics on a regular basis through a scheduled job and leaving the auto update enabled as a safety. The function sys.dm_db_stats_properties is included, which provides the same information found in the header of DBCC SHOW_STATISTICS, as well as a modification column that could be used to track changes and programmatically determine if an update was needed. Remember my preference for using a job to update stats? That job just got a lot smarter with this DMF…now I can look to see how much data has been modified and ONLY update statistics if a certain percentage of data has changed. Slick. Updating statistics will not cause plans to be invalidated IF no rows have changed. This is one that surprises a lot of people, and Kimberly has a fun post, What caused that plan to go horribly wrong – should you update statistics?, that walks through her adventure in figuring this out. DBCC SHOW_STATISTICS only requires the SELECT permission – previously it required a user to be a member of sysadmin, or a member of the db_owner or db_ddladmin database role. This can be globally disabled with trace flag 9485. Cumulative Update 1 introduces a fix related to ascending keys not being properly identified even with trace flags 2389 and 2390 in use. This requires trace flag 4139 in addition to CU1, as noted in KB 2952101. The new Cardinality Estimator is introduced, implemented by setting the database compatibility mode to 120, or by using trace flag 2312. If you haven’t read anything about the new CE I recommend starting with the Cardinality Estimation documentation and then reading Joe Sack’s whitepaper, Optimizing Your Query Plans with the SQL Server 2014 Cardinality Estimator, for in-depth details. The behavior from Trace Flags 2389 and 2390 for ascending keys is now implemented via the database compatibility mode. If your databases compatibility mode is set to 120 (or higher in later releases), you do not need to use Trace Flags 2389 and 2390 for SQL Server to identify statistics that have ascending keys. Incremental statistics are introduced for partitions, and can be viewed through the new DMF sys.dm_db_incremental_stats_properties. Incremental statistics provide a way to update statistics for a partition without updating them for the entire table. However, the additional statistics information from the incremental statistics is not used by the Query Optimizer, but it is folded into the main histogram for the table. CU2 includes the same fix mentioned above for SQL Server 2012 SP2 that also requires trace flag 4139. Trace flag 7471 is back-ported to CU6, originally available in SQL Server 2016 as noted below. Trace flag 2371 is no longer needed to reduce the threshold for automatic updates to statistics if the database compatibility mode is set to 130. See Controlling Autostat (AUTO_UPDATE_STATISTICS) behavior in SQL Server. Updates to statistics can run in parallel when using SAMPLE, not just FULLSCAN. This is tied to the compatibility mode (must be 130), but can potentially provide faster updates and thus decrease maintenance windows. Aaron Bertrand talks about this enhancement in his post, A potential improvement for statistics updates: MAXDOP. Trace flag 7471 is introduced in CU1 to allow multiple UPDATE STATISTICS commands to run concurrently for a single table and Jonathan provides some great examples of how this can be used in his post Improved Support for Parallel Statistics Rebuilds. The query hint option ENABLE_HIST_AMENDMENT_FOR_ASC_KEYS is introduced, along with the FOR HINT argument, which is the equivalent of trace flag 4139. The DMF sys.dm_db_stats_histogram is exposed in CU2, which is an alternative to the histogram output from DBCC SHOW_STATISTICS. The information in both is the same, use what’s easier for you or better fits the problem you need to solve. The option PERSIST_SAMPLE_PERCENT is introduced in CU4, which can be used to force the same sampling rate to be used every time a statistic is updated going forward, and examples of this behavior can be found in the post, Persisting statistics sampling rate. The attributes StatsInfoType and OptimizerStatsUsageType are added to the Query Plan, which lists statistics used during query optimization. This is pretty cool! I haven’t had a chance to play with this yet, but to get this information previously you had to use undocumented trace flags. If you are looking to upgrade to a newer release, or if you’ve recently upgraded, take note as to how these changes impact your solution. We’ve had many clients contact us after upgrading from 2005/2008/2008R2 to 2014 or 2016, complaining of performance issues. In many cases, adequate testing was not completed prior to the upgrade. This is something we really focus on when we’re helping a client upgrade. Beyond the steps to move a production instance from one version to another with little downtime, we want to make sure that the day after the upgrade is a boring one for DBAs and developers. We don’t simply test the upgrade process, we test what the system looks like after the upgrade. Are the same trace flags from the old environment needed in the new one? What database settings need to be adjusted? Does query performance change – for better or worse? If you don’t know the answers to those questions before you upgrade production, then you’re setting yourself up for one to many days of fire-fighting, Sev 1 calls, meals at your desk, not enough sleep and who knows what else. Take the time up front to understand the impact of the new features and changes in functionality listed above, plan the upgrade, and test as much as possible. The post UPDATEs to Statistics appeared first on SQLPerformance.com. Initial information about Managed Instance is available in this blog, and more information will become available later in 2017 and 2018. For now, the rest of this blog will target the current Azure SQL Database service. In today’s Azure SQL Database, there are four service tiers: Basic, Standard, Premium, and Premium RS. Each service tier has different capabilities and goals, described in What are Azure SQL Database service tiers. [July 2018 update]: The new vCore purchasing model for Azure SQL Database introduced the General Purpose and Business Critical service tiers, which are analogous to Standard and Premium service tiers. The Premium RS service tier has been deprecated. Within each service tier, several performance levels are available. Each performance level comes with a certain allocation of resources, and can therefore sustain a certain level of performance for a given database workload. The performance level determines the cost of the database. [July 2018 update]: Resources available in each performance level are documented for the DTU purchasing model, and for vCore purchasing model. Clearly, how to choose the most appropriate service tier and performance level is a top question for most customers, whether using Azure SQL Database for a new application, or migrating an existing application. At the same time, the answer is rarely straightforward. Even when you know the resource demands of the existing database in the on-premises environment exactly, multiple factors can change these demands during cloud migration, making the choice of the performance level an art, rather than science. For a more detailed discussion of this topic, refer to the Service Tier Considerations section of this blog. The strategy of making an educated guess of the performance level, monitoring performance, and adjusting it up or down has worked quite well for many customers, reducing the importance of getting the performance level “just right” from the outset. 3. The Premium tier is used for workloads that are the most demanding in terms of performance and availability. Its most distinguishing features are local SSD storage with sub-millisecond latency, and the use of multiple online replicas for fast failover, typically within single seconds. Additionally, certain database engine features such as In-Memory OLTP and Columnstore Indexes are only available in Premium. [July 2018 update]: Columnstore indexes are now also supported in Standard databases (starting with S3), and in all General Purpose databases. [July 2018 update]: The vCore purchasing model simplifies the choice of performance level by allowing the customers to select the actual number of logical CPUs (vCores) for their database, and use specific hardware generations with documented per-core ratios for memory and IOPS. The transaction log and tempdb limits are also documented for each performance level. Once you know the top resource consumer queries, you can examine their plans and tune them, i.e. via query rewrite or via indexing changes. If multiple plans for the same query exist, Query Store provides the ability to force the most efficient plan. Azure SQL Database can automate the process of forcing optimal plans on an ongoing basis, effectively resulting in a self-tuning database. For more details, see Automatic tuning. This is also available in the portal under the Automatic tuning blade. The xel files written to a storage container can be copied locally and opened in the SSMS XEvents UI, or queried from T-SQL. For additional details about elastic pools, see Elastic pools help you manage and scale multiple Azure SQL databases. So far, we have been talking about server-level firewall rules. In addition, or instead of server-level rules, database-level rules can be used as well. For many scenarios, database-level rules have an advantage. Specifically, they make the database more portable. If the database is moved to a different server, or if a replica of the database is created, the firewall rules are preserved, and no additional configuration is required on the new server. On the other hand, if you have many databases on a logical server, then it may be easier to manage firewall rules at the server level, rather than in each database. For more details on firewall rules, see Azure SQL Database server-level and database-level firewall rules. One important point to note is that server-level and database-level rules are not “one on top of the other”. A connection attempt is allowed if either a server-level or a database-level rule allows it. VNet Service Endpoints is a new option for managing network security in Azure SQL Database, currently in preview in a subset of regions. [July 2018 update]: VNet Service Endpoints are now Generally Available. This feature lets a network administrator allow connections to the database server only from a particular subnet in an Azure VNet. This allows a commonly asked for scenario where no IP address-based firewall rules are created at all, and only connections from a private VNet (or several such VNets) are allowed. Importantly, the public IP endpoint for the database still exists; however, access to this endpoint is controlled by specifying VNet/subnet identifiers, rather than by specifying public IP addresses. Managed Instance, once available, will allow the instance to be created within a VNet, and accessible only via a private IP address, resolving the security and compliance concerns that many customers have today. Another note is related to ADO.NET connection pooling, which implements a behavior called “blocking period”. For details, see SQL Server Connection Pooling (ADO.NET). In summary, if an error occurs when a connection is being opened, connection attempts made in the next five seconds will fail fast without actually attempting to connect to the database. Furthermore, if connection attempts made after five seconds continue to fail, the blocking period will be progressively increased. As a practical outcome, this means that with blocking period enabled, connection failures should be initially retried after at least five seconds have elapsed, to avoid being further delayed by the blocking period. Azure SQL Database implements a mechanism that guards against Denial Of Service (DOS) attacks. This mechanism may be triggered if the number of connection attempts per unit time exceeds a certain threshold. This is relevant in the context of implementing retry logic. If retries are too aggressive, i.e. if the application attempts to reestablish all connections at the same time or in a tight loop, then the DOS mechanism may be triggered. The symptom of triggering DOS protection is getting error 18456, “Login failed for user …”, with state code 113. If this happens, consider adding a randomized delay before attempting to reconnect, or implement an exponential back-off policy for retries. Before implementing retry logic in your application, we strongly recommend reviewing Troubleshoot, diagnose, and prevent SQL connection errors and transient errors for SQL Database for detailed info. In principle, the answer is the same as it is for the traditional SQL Server. Bulk load still provides the highest throughput. This includes methods such as BCP, BULK INSERT, OLEDB Destination in SSIS, the SqlBulkCopy class in ADO.NET, and SQLServerBulkCopy class in JDBC Driver. One significant difference between SQL Server and Azure SQL Database is that the latter uses resource governance to limit the amount of resources available in each performance level. Transaction log write throughput is one of governed resource types, and it is often 100% utilized during bulk load, limiting load throughput. If your large data load is an infrequent event, consider temporarily scaling up to a higher performance level that allows higher transaction log write throughput. To monitor resource consumption during data load and see if log write is the bottleneck, use the sys.dm_db_resource_stats DMV, as described in Monitoring database performance in Azure SQL Database. Note that you may be able to reduce log usage by using clustered columnstore indexes and using batch sizes larger than 102400 rows, to load directly into compressed row groups. For details, see Columnstore indexes – data loading guidance. One new method for loading data into Azure SQL Database is using BULK INSERT to load data from Azure Blob Storage. This supports both native BCP and CSV files as the source. If copying data from an on-premises database, an efficient way would be to export data in native BCP format, upload to a storage account in the same region as the target Azure SQL DB database using AzCopy, and then load into the target database using BULK INSERT. For Azure SQL Database, the usual advice for this type of applications has been to refactor code to batch database requests as much as possible, as described in How to use batching to improve SQL Database application performance. That advice is still sound (and not just for Azure SQL Database), and should be followed when developing new applications. One improvement has been in place for some time, and is known as client redirection. This removes the regional gateway from the network path for established connections, thus significantly reducing network latency. Client redirection is described in Azure SQL Database Connectivity Architecture, with additional details available in Connect to Azure SQL Database V12 via Redirection. By default, client redirection is enabled only when the client IP address is a part of Azure IP address space. If the client is outside of Azure, the latency of the WAN link is likely large enough to make the improvement from using client redirection insignificant. Nevertheless, if warranted, client redirection can be enabled for all clients, as described in the previous two links. Azure SQL Database also takes advantage of the Accelerated Networking (AN) improvement in Azure. While this is not yet available for all databases, the observed roundtrip network latency for databases on AN-enabled infrastructure that also use client redirection is below 1 ms. [July 2018 update]: If using the vCore purchasing model, customers can choose Gen5 as the hardware generation. All Gen5 capacity in Azure SQL Database is AN-enabled. Most of the time, Azure SQL Database is positioned as most appropriate for transactional OLTP workloads, i.e. the workloads consisting primarily of many short transactions occurring at a high rate. While such workloads do indeed run well in Azure SQL Database, some types of analytical and data warehousing workloads can also use the service. In the Premium service tier, Azure SQL Database supports columnstore indexes, providing high compression ratios for large data volumes, and memory-optimized non-durable tables, which can be used for staging data without persisting it to disk. [July 2018 update]: Columnstore indexes are now also supported in Standard databases (starting with S3), and in all General Purpose databases. At higher performance levels, the level of query concurrency is similar to what can be achieved on a traditional SQL Server instance in a large VM, albeit without the ability to fine-tune resource consumption using Resource Governor. While SQL Server in an Azure VM always uses remote storage for database files, the Premium/Business Critical service tier in Azure SQL Database uses local SSD storage, which provides much higher IOPS/throughput, and makes Azure SQL Database attractive for small to medium scale analytical workloads. Scaling out in this context refers to using multiple similarly structured databases to serve the application workload. The goal is to use much higher (in theory, limitless) amounts of compute and storage resources than what is available to a single database even in the top performance tier, and thus achieve much higher degree of performance and concurrency. There are two Azure SQL Database features to consider here: Geo-replication and Elastic Scale. Elastic Scale, or more specifically Elastic Database Client Library, allows you to shard your data over many databases. Thousands of databases are supported. Unlike Geo-replication, these databases are not read-only replicas; each database contains a distinct subset of data, and is both readable and writeable. The client library facilitates querying of these databases by using a shard map, which is stored in a separate database, describing the allocation of data across database shards. The post Cray and Microsoft Bring Supercomputing to Microsoft Azure appeared first on DATAVERSITY. Is the Microsoft R Client a…client? The post Migrating to Azure SQL DB using Transactional Replication appeared first on LobsterPot Blogs. The post They Did it Again – The Release of SQL Server 2017 appeared first on Kevin Kline. Azure SQL Database Managed Instance is a new flavor of Azure SQL Database that is a game changer. It offers near-complete SQL Server compatibility and network isolation to easily lift and shift databases to Azure (you can literally backup an on-premise database and restore it into an Azure SQL Database Managed Instance). Think of it as an enhancement to Azure SQL Database that is built on the same PaaS infrastructure and maintains all it’s features (i.e. active geo-replication, high availability, automatic backups, database advisor, threat detection, intelligent insights, vulnerability assessment, etc) but adds support for databases up to 35TB, VNET, SQL Agent, cross-database querying, replication, etc. So, you can migrate your databases from on-prem to Azure with very little migration effort which is a big improvement from the current Singleton or Elastic Pool flavors which can require substantial changes. I have created a presentation about Managed Instance here. If you are not familiar with Azure SQL Database, first check out my introduction presentation. Azure SQL Database Managed Instance is in private preview, and will be in public preview this calendar year and it will be generally available next calendar year. For more details see the presentation at Ignite by Drazen Sumic called “Modernize your on-premises applications with SQL Database Managed Instances (BRK2217)” and this blog post by Lindsey Allen. There was also a presentation at Ignite called “What’s new with Azure SQL Database: Focus on your business, not on the database (BRK2230)” on the new features in SQL Database (Adaptive Query Processing, SQL Graph, Automatic Tuning, Intelligent Insights, Vulnerability Assessment, Service Endpoint) as well details on Azure Data Sync and an introduction to Managed Instances. Managed Instances versus Azure SQL Database—What’s the Right Solution for You? The next release of Microsoft SQL Server, announced as SQL Server 2017, is available for download in CTP2 at http://tinyurl.com/SQLvNextLinux and offers many cool new features. One set of features that I really like to focus on is adaptive query processing. These new features speed processing of workloads, especially those that have historically been the hardest to tune. The post Adaptive Query Processing in SQL Server 2017 appeared first on Kevin Kline. We’re happy to report that Gartner has positioned Microsoft in the Leaders Quadrant in the 2017 Magic Quadrant for Operational Database Management Systems again this year. This is the third year that Microsoft has been positioned farthest in completeness of vision and ability to execute in the operational database management systems market. At Microsoft, we’re dedicated to helping both enterprises and individuals realize their full potential. Our industry position in Operational DBMS is due to the unequaled capabilities of SQL Server. The release of SQL Server 2017 brings the power of SQL Server to Windows, Linux, and Docker containers for the first time ever. Developers are able to build intelligent applications using preferred languages and environments, while enjoying in-memory performance across workloads, mission-critical high availability, and in-database advanced analytics. You can develop once and deploy anywhere in a consistent experience across your datacenter and public cloud. SQL Server proves itself, year over year, to be the least vulnerable DBMS in the industry. Built for security from the ground up, SQL Server offers customers a layered protection approach that incorporates encryption, authentication, and monitoring and auditing at the disk, database, and application levels. Innovative security technologies like Always Encrypted, for encryption at rest and in motion, help transform global operations for the better. Perhaps most noteworthy for organizations living in the real world of cost-benefit analyses, SQL Server 2017 remains one of the most cost-competitive DBMS offerings in the enterprise space. In fact, you can get all the robust business capabilities in SQL Server 2017 built-in to a single product SKU, without expensive add-ons — for one great, low total cost of ownership. But don’t just take our word for it. We encourage you to take the time to read the full Gartner report. And then take a moment to see how you can get free licenses when you migrate to SQL Server 2017. We’re confident you’ll find the industry-leading database you know and love — now across operating systems and application platforms, on-premises and in the cloud. This graphic was published by Gartner, Inc. as part of a larger research document and should be evaluated in the context of the entire document. The Gartner complete document is available now. The post Azure Virtual Machine Developments for SQL Server Usage appeared first on SQLPerformance.com. For each group in a query, the LISTAGG aggregate function orders the rows for that group according to the ORDER BY expression, then concatenates the values into a single string. As a next step, I have used Python UDF to dynamically build pivoting query ( I love Python more and more, this is such a nice language :-) . In addition, I have used Common Table Expression CTE ( yes, they have it! ) to pass a list of pivoted columns to Python UDF. The last step, execution the SQL query, I am still trying to figure out – there is no dynamic query execution in Redshift SQL dialect. But my customer can execute this query from reporting tool. Here is a setup and all queries. pivot_query = " select "
Microsoft is pleased to announce that the appliance update, Analytics Platform System (APS) 2016, has been released to manufacturing and is now generally available. APS is Microsoft’s scale-out Massively Parallel Processing fully integrated system for data warehouse specific workloads. This appliance update builds on the SQL Server 2016 release as a foundation to bring you many value-added features. APS 2016 offers additional language coverage to support migrations from SQL Server and other platforms. It also features improved security for hybrid scenarios and the latest security and bug fixes through new firmware and driver updates. APS 2016 runs on the latest SQL Server 2016 release and now uses the default database compatibility level 130 which can support improved query performance. SQL Server 2016 allows APS to offer features such as secondary index support for CCI tables and PolyBase Kerberos support. APS 2016 supports a broader set of T-SQL compatibility, including support for wider rows and a large number of rows, VARCHAR(MAX), NVARCHAR(MAX) and VARBINARY(MAX). For greater analysis flexibility, APS supports full window frame syntax for ROWS or RANGE and additional windowing functions like FIRST_VALUE, LAST_VALUE, CUME_DIST and PERCENT_RANK. Additional functions like NEWID() and RAND() work with new data type support for UNIQUEIDENTIFIER and NUMERIC. For the full set of supported T-SQL, please visit the online documentation. PolyBase now supports the latest Hortonworks HDP 2.4 and HDP 2.5. This appliance update provides enhanced security through Kerberos support via database-scoped credentials and credential support with Azure Storage Blobs for added security across big data analysis. Hardware architecture updates bring the latest generation processor support (Broadwell), DDR4 DIMMs, and improved DIMM throughput – these will ship with hardware purchased from HPE, Dell or Quanta. This update offers customers an enhanced upgrade and deployment experience on account of pre-packaging of certain Windows Server updates, hotfixes, and an installer that previously required an on-site download. APS 2016 also supports Fully Qualified Domain Name support, making it possible to setup a domain trust to the appliance. It also ships with the latest firmware/driver updates containing security updates and fixes. The latest APS update is an addition to already existing data warehouse portfolio from Microsoft, covering a range of technology and deployment options that help customers get to insights faster. Customers exploring data warehouse products can also consider SQL Server with Fast Track for Data Warehouse or Azure SQL Data Warehouse, a cloud based fully managed service. For more details about these features, please visit our online documentation or download the client tools. Every year when many of the SQLSaturday event leaders meet at the Summit the topic of improvements to the tools comes up. Certainly the site has seen changes and improvements over the years, plus at least two new coats of paint (on the public site), but it’s never enough (with software, it never is). Invariably the question that gets asked is ‘why can’t we help?’. It’s a fair question, and perhaps one that deserves a new answer. Back in 2009 or 2010 we took a first crack at getting volunteers access to the source code and it just failed. Setting up a VPN, credentials, no test suite, no governance, just didn’t work. Keep in mind PASS was not a software shop then and getting good at that stuff takes time and expertise. Maybe it’s been tried since, but my sense is that its been just the HQ Devs making changes. So if that is all the way on one side of the scale (super closed system), the far other side is to open source it. Open source is also not simple. If you’re on the PASS Board you have to care about the potential loss of intellectual property. Scoff do you? No, there is no magic in the code, but it’s sweat equity and it’s a substantial part of what drives new members (and new email addresses for existing members) into the mailing list. Do you really want people forking it and spawning variations under different names? Write the governance process. This is the hardest piece. Who will approve pull requests? Who decides which features get added? Who will do the testing? How often will releases be done (since PASS has to coordinate that)? Code standards. Rules about fonts and logos – all the stuff you deal with any dev shop. Down the road a little build a true dev environment where the latest code can be loaded and tested. I’m not kidding about governance being hardest. There are changes I want that you don’t care about, fine. But what if I want it to work differently than you do? How do we decide that? How do we decide when to mashup with an external app vs building a feature? I can see having a committee to manage the process, but I’d hope for a lot of opportunity for event leaders to weigh in, perhaps even voting on change before someone invests effort to build/fix something. We could do all of that and it might or might not work. Could be a huge win, could be we just argue about everything! Even assuming a win, it’s a lot of effort to get it all set up. So…what could we do to test the waters in more agile fashion? What if we just did the first two steps above, putting the source in Git (might already be there, don’t know) and creating the access agreement doc. That’s what, a couple three days? Then, announce it. You want to contribute, sign up, look at the code, then email someone at HQ about what and how you propose to change something. If they say yes, you build it. If no, you work through the conversation about why. Nothing about the process needs to be secret, so you could just as easily write a blog post that explains the proposed change and get feedback before submitting it for approval. If it really works, PASS will get a lot of email and a lot of stuff done that will require testing and release, causing perhaps enough pain to merit building out the test environment and a full governance process. If only a few people make changes we’ll have a lightweight process that enables that. If no one does anything, PASS will have spent a few hours that surely won’t end up being a total waste. Is the risk worth the reward? The Board will have to weigh in on their side. What about us, the ones who want tweaks and twists, can we be work through non-trivial conversations about what to do or not do, or must it be anarchy where everyone has to have it their way and nothing gets done? Patience and transparency will be required. That seems possible, but not necessarily easy. There is rarely one right answer. I also want to point out that this wouldn’t change the need to have devs on staff at HQ. We’ll need them for bigger features, other products, plus testing and release. They will get to essentially lead an open source project. Hard to imagine that they wouldn’t find that prospect exciting! Fear kills ideas like this one. What if, what if, what if. We deal with that in two ways. One is to honestly consider concerns raised and find ways to mitigate them. The other is to clearly frame this as a trial, a proof of concept. Make sure we have a continued dialog about is working and what is not, and then use an open process to evolve changes to the process. So, how do we get this done? Or, should we? I’m looking for input on the approach. If you have a better one, blog it and send me the link. Have a suggestion for a tweak or see a concern not addressed? Post a comment. I’m putting a reminder on my calendar for December 8. I’ll come back to this post then, look at the comments again and any other ideas out there, then I’ll repackage it into a public letter to the Board to be published here on Dec 15, unless there clearly needs to be more debate. If someone else has a better approach, I’ll sell that one. Grant Fritchey takes over the big chair Jan 1. If we hit the dates above he can have this in time to discuss at the January 2018 Board meeting and if he thinks its worth doing and can address any concerns raised there, we could see this up and running by the end of Q1. Wouldn’t that be an interesting way to start the new year? The post Study Reveals Gap Between CEO Expectations for Digital Transformation and IT Readiness appeared first on DATAVERSITY. This article describes how to extract raw data stored in the Tabular engine, used by Analysis Service Tabular, Power BI, and Power Pivot. When you look at the content of a table in Power BI, SQL Server Data Tools (SSDT) for Visual Studio, or Power Pivot, the queries sent to the Tabular engine use a syntax that guarantees minimal materialization and fast performance. For that purpose, Power BI uses a DAX syntax whereas Analysis Services and Power Pivot use a special SQL syntax. DISCLAIMER: The content of this article includes information derived from the analysis of queries sent by the existing tools. It is not documented by Microsoft. All these techniques are subject to change in future releases, and might not be supported by Microsoft. For example, this is how Power BI queries the Sales table when you go in Data view. You can try the same query using DAX Studio, and you can monitor what Power BI does by enabling the All Queries trace feature in DAX Studio. SQL Server Data Tools (SSDT) for Visual Studio and Power Pivot use a different user interface that generates the query to Tabular through a SQL syntax. This syntax is a subset of the SQL syntax that was already allowed in Analysis Services Multidimensional to query the model, provided you set the SqlQueryMode to DataKeys in the connection string. NOTE: You should include the string SqlQueryMode=DataKeys; in the connection string. You can do this in the Advanced Options of the Connect dialog box in DAX Studio, as you can see in the following screenshot. The TOP condition specifies how many rows to include in the result. Any reference follows the [Model] identifier. The table name must be prefixed with $ and within square brackets if it includes spaces or special characters. The square brackets are also optional for the column name, and are required only for special names. However, it is a good idea to always use square brackets for table and column names. If you use * instead of a list of columns, you get all the columns of the table including the special RowNumber column. The special RowNumber column identifies the physical position of a row in the table (this is not accessible in DAX). As you see, RowNumber is a zero-based index. Do not confuse this number with the row number of the result. In fact, if you sort the data you obtain the RowNumber of the physical position in the raw table – which could be different from the sort order of the physical table in the data source because of the arrangements made by the compression algorithm in VertiPaq. The next query skips 26,000 rows and returns 1,000 rows following the descending sort order defined by the OrderDateKey column. Also in SQL, it is not possible to specify more than one column for the sort order. The following query returns 1,000 rows skipping 2,000 rows from the Sales table ordered by OrderDateKey and filtering only one product. 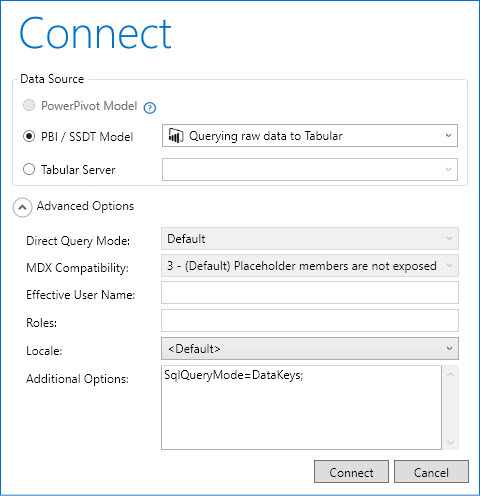 Querying raw data stored in a Tabular model can be useful if you create a tool that needs to quickly browse data, similarly to the Power BI and SSDT user interface when you design a data model. Considering that you can apply filter and sort order on a column, this could be an alternative way to execute a drillthrough operation on a large table in a standard report environment where you control the query generation (such as SQL Server Reporting Services). Many thought it was an early April Fool’s Day prank, but it was no joke: On March 7, 2016, Microsoft announced the beta release of SQL Server on Linux with the intention of shipping a full release of the product in 2017. The post SQL Server on Linux – It’s No Joke appeared first on Kevin Kline. The post TSQL Tuesday #96: Folks Who Have Made a Difference appeared first on Paul S. Randal.